Thanks to the partnership of Foodbuzz and Kelloggs® All Bran® cereal, I was the lucky recipient recently of three varieties of Kellogg's® Bran cereal. This is really good stuff if you need to increase the fiber in your diet and it is loaded with vitamins to boot. 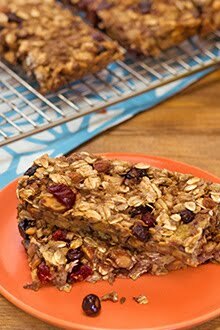 I was up to the challenge of finding a way to incorporate some of this bran in a healthier alternative to my usual fattening desserts. It just so happens that I had a bag of frozen raspberries in the freezer--the result of my failed effort to find the fresh stuff at the grocery store last week (apparently there is a drought in California). 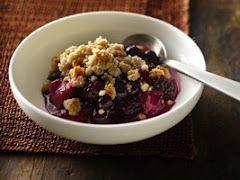 The raspberries, combined with some fresh strawberries left over from a huge Costco run and the remnants of a bag of frozen blueberries all seemed to be screaming at me to make a fruit crisp. Raspberries and bran? Hmmm....it sounded kind of good. Preheat oven to 350 degrees F; spray a 9 1/2 inch deep dish ceramic pie plate (or use a casserole dish) with cooking spray. In a large bowl, combine the berries, sugar and orange liqueur. Toss lightly to coat. 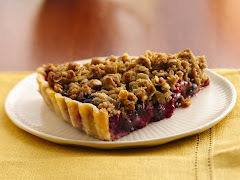 Place the berries in the prepared pie plate and set aside. Not fond of berries? Simply substitute some apples, peaches or pears. 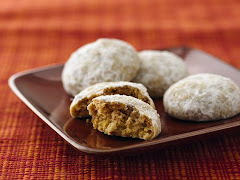 In the mean time, combine the whole wheat flour, oatmeal, bran flakes, brown sugar, cinnamon and salt in a medium bowl. Cut in the butter until the mixture resembles coarse crumbs. Sprinkle evenly over the berries. Bake for 40 to 45 minutes until the top is browned and the fruit is bubbling. Serve warm with ice cream, if desired. OK--make it ice milk, if you want. Me? I'm having ice cream. Who knew bran could taste so good? I'm not so good with to-do lists, but I like the part where I can cross something off. The thing is, that's usually how my to-do lists start....I write something down that I've already done and then I get to cross it off, hee hee. 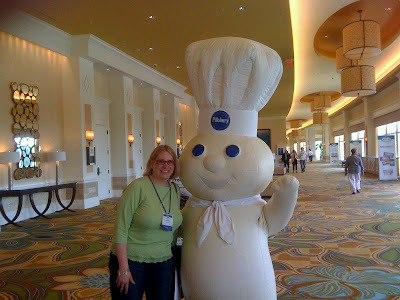 So it is for my Bucket List; a list that I never started until I got to cross off a really neat thing: Become a finalist at the Pillsbury Bake-Off®. Flash forward to September 1st, 2009. 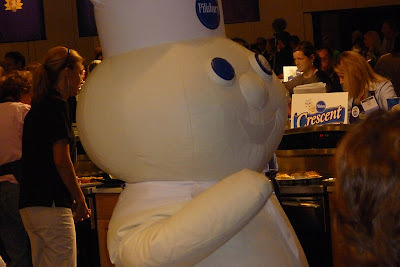 I knew from my cooking contest website that Pillsbury was calling. I'd gone through this before....every two years I'd wait with much anticipation for that call and always my hopes were dashed. But on this day, at about 4:00 o'clock in the afternoon, as I sat in my cubicle at work, my phone rang.....and the caller ID said General Mills. I won't go into boring detail of the months before the actual event. 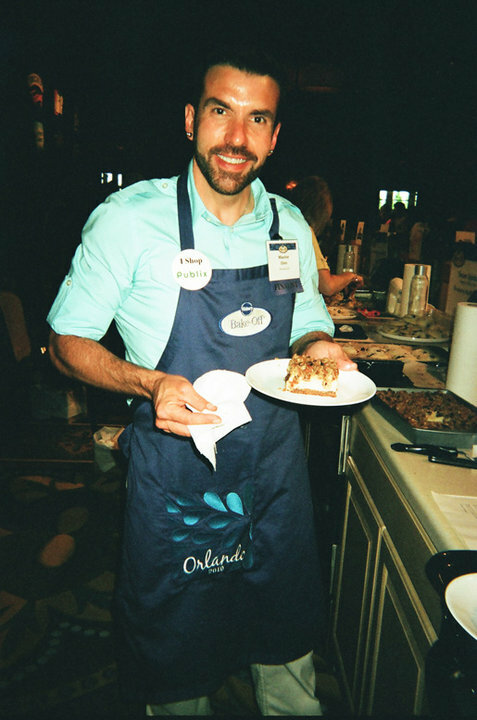 Suffice to say, my life from the moment I received "the" call until my arrival in Orlando for the Bake-Off® was a non-stop Pillsbury blur. There were videos to be made, official pictures to be taken, media events to be planned and, most significantly, friendships with other finalists to be formed. There were about 40 of us that found each other, mostly through our connection with Contest Cooking Central, a website devoted to, you guessed it, cooking contests. 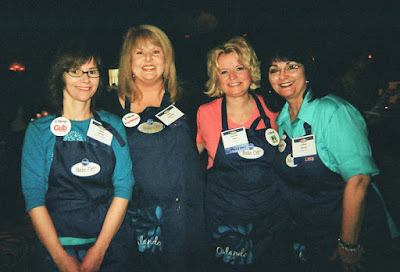 We formed our own group on Facebook; a support group, if you will, that kept us sane for the duration of the journey to the Bake-Off®. 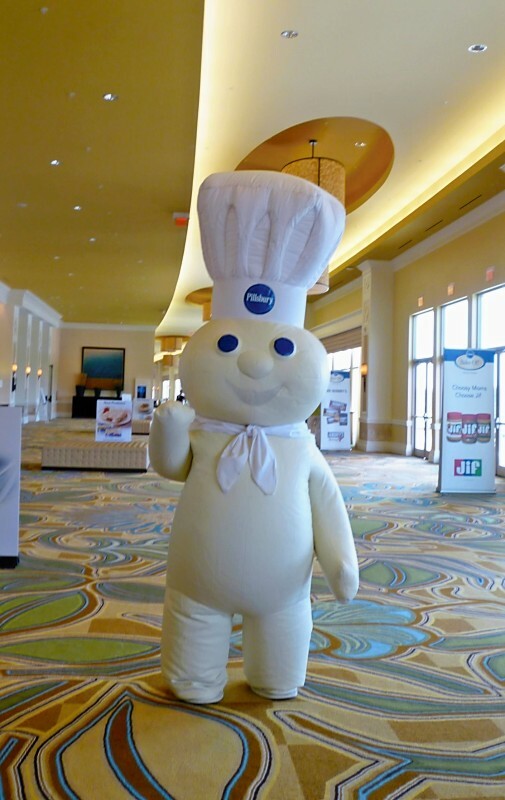 Here, we could talk to each other about all things Bake-Off®. What were we going to wear? Who's getting interviewed? What kind of crazy dreams were we having? We were all sharing the same fantastic experience, and we could log in and talk about our Bake-Off® obsessed thoughts when our families and co-workers started getting tired of hearing about it. Oprah correspondent Ali Wentworth with fellow Minnesotan (and GE Imagination Award winner) Laura Stanke. Check out her Pepperoni-Pesto Popovers. Not that friends and family weren't supportive---suddenly everyone was a waffle fan! There was talk of waffle parties and get-togethers to watch the big event (unfortunately, Food Network didn't film this year, so those hopes were dashed). There were no bigger supporters than my co-workers, who threw me a huge surprise send-off with a gigantic Doughboy themed cake. 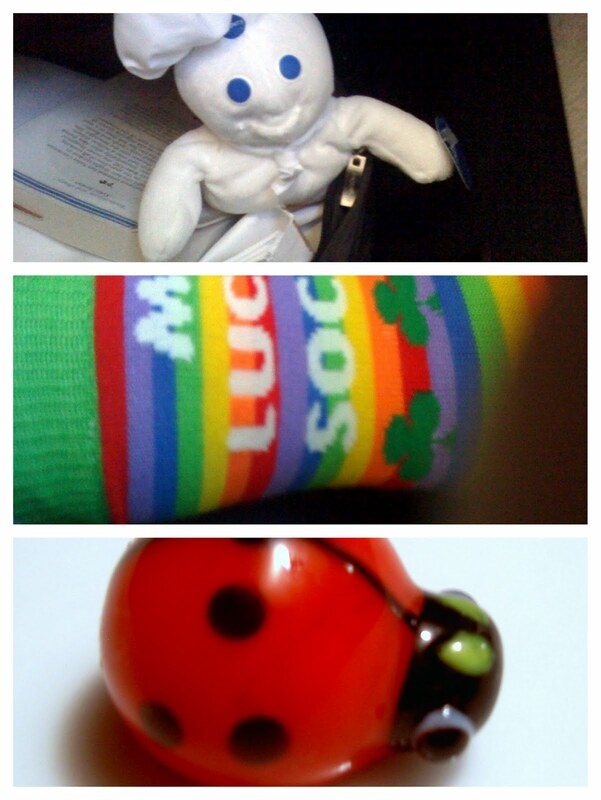 Along with such a terrific send-off, some of my friends gave me good luck keepsakes to take along. I had good luck socks, a good luck doughboy, and an incredible gift from my friend Tresa Hargrove--a lucky ladybug--the same kind her daughter kept in her pocket during each of Tresa's successful kidney transplants. I had always heard that Pillsbury treated their Bake-Off® finalists like royalty and, as it turns out, they really do! The event was held in Orlando, Florida at the Bonnet Creek Hilton---a beautiful new hotel in the heart of Disney World. 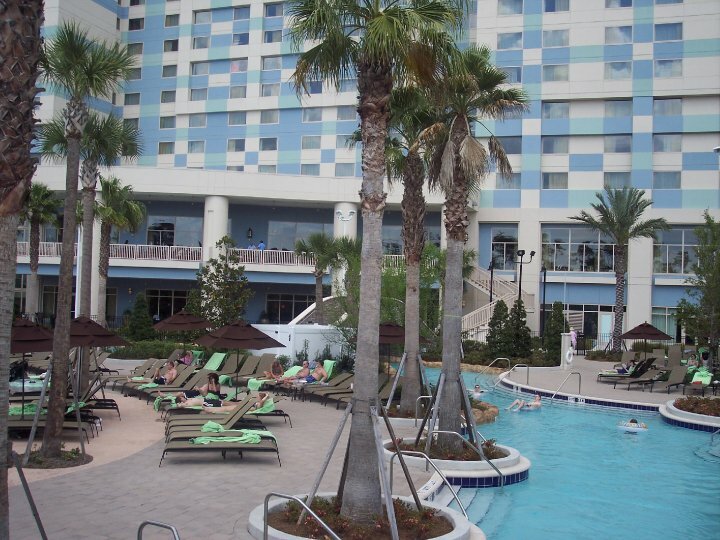 Once at the hotel, there was a non-stop flurry of activity. 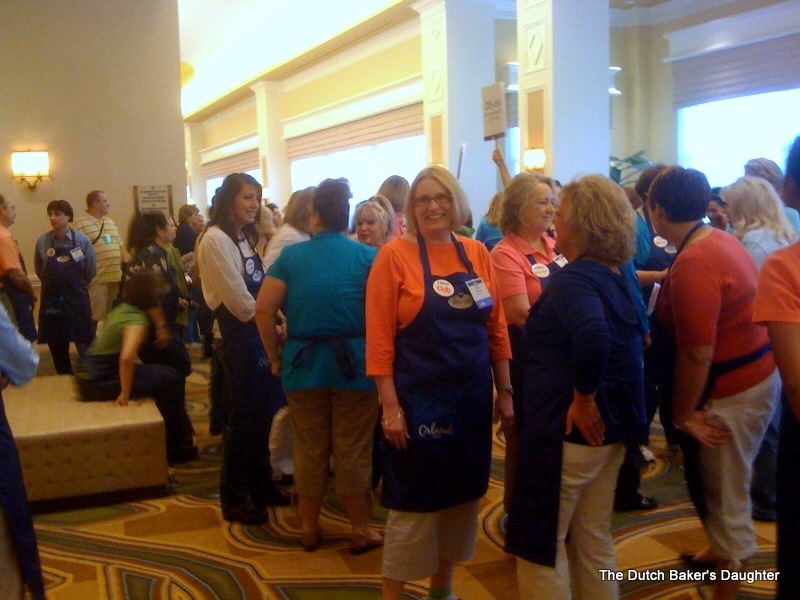 Registrations, orientations, a fabulous welcome dinner, official photos, questions & answers, an early morning breakfast, the official grand march, music and hoopla and then....it was here...I was in front of my stove, and a large voice was announcing the start of the 44th Pillsbury Bake-Off®! Sandra Lee was on hand to give us a little speech at breakfast. Later, she was the emcee at the awards ceremony. As we stood before our stoves, we had 20 minutes to take it all in and orient ourselves before the media was let loose. My range number was 85, and this put me in the very back corner of the room, isolated somewhat from the chaos in the middle of the floor. My range neighbor to the left, Maurice Chinn from Georgia, was making his Oatmeal Raisin Cheesecake Crumble and my range neighbor to the right was Sue Compton from New Jersey, who was making her Mini Ice Cream Cookie Cups. I know, right? The million dollar recipe was right next to me and I didn't even know it! My range neighbor, Maurice Chinn with his tasty Oatmeal Raisin Cheesecake Crumble. The enormity of the whole experience did not hit me until I was standing in front of that stove. There was a million dollars at stake!! That General Mills took it seriously was very evident. 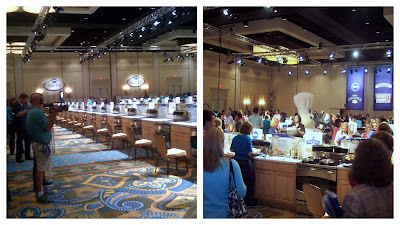 There were Bake-Off officials standing guard, one for every 4 or 5 stoves, to make sure we were following the rules. We had 4 hours in which to complete our recipes up to three times; once for the judges, once for the official photo, and an optional third time in case we needed it, or in case we wanted to provide samples. 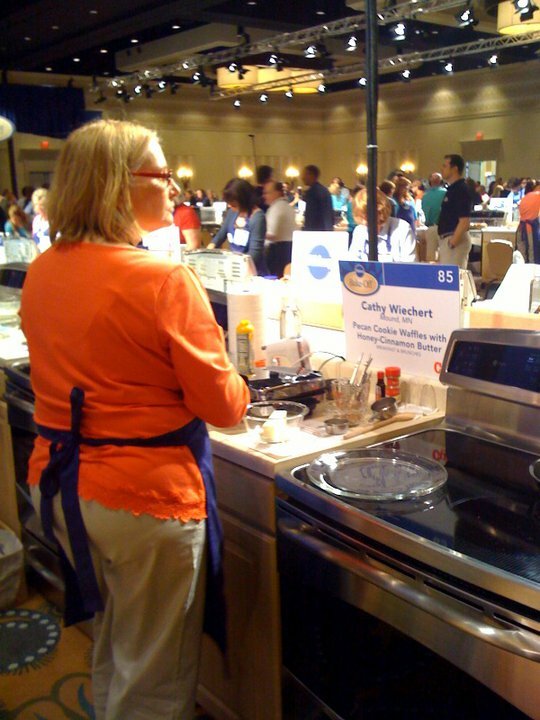 The recipes had to be made exactly as we had submitted them, using equipment and ingredients provided by General Mills. Several months previous to the event, we had signed off on lists of equipment and ingredients----a list that I should have paid more attention to back then. One look at the waffle iron provided and I knew I was in trouble. 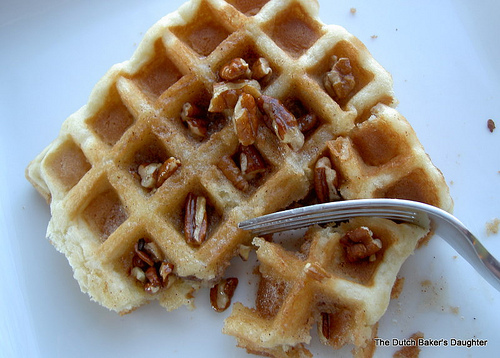 From the very beginning, I had made my recipe on a Belgian waffle iron. I didn't even realize a regular waffle iron existed anymore....I did look in the stores. But here, at my station, was a waffle iron (obviously used) that seemed to come out of the '70's (I did look the brand up online afterwards, and it is a current model). Now, I had to make my waffles on equipment I wasn't familiar with. To make matters worse, there wasn't a mixing bowl to make the waffles in---I had actually approved a list with no mixing bowl! Oh well, I had to make do---I was getting ready to mix my waffles in a small butter bowl, when a large mixing bowl was brought to me---whew (am I an idiot, or what?)! At this point I was wondering how the hell I was going to get a decent waffle out of the waffle iron I had. You will notice the stunned expression on my face. Just as I was getting started, the media was let loose. The first person I saw was Sandra Lee, of Food Network fame. She stopped at my kitchen to see what I was making and seemed very interested in the fact that my waffles were made out of cookie dough. She wished me luck, gave me hug and an air kiss and was on her way. Then came some cameras and a mini interview and I was back to making my waffles. The waffles were not turning out as I had hoped, but I decided to use my first batch for the judges as I was afraid that subsequent batches would start to stick (we didn't have running water to clean the waffle iron between batches). My second batch went to the photographer and I bagged the third batch as it was actually getting close to noon. Who knew time could go by so quickly? 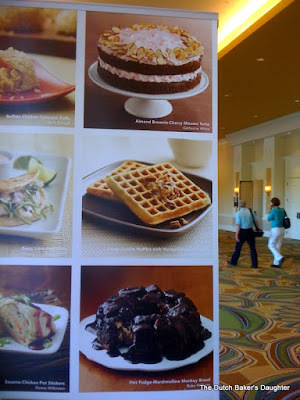 Giant pictures of our food on billboards in the hotel. One of the things that I was looking forward to with my trip to the Bake-Off®, was the opportunity to meet up with Babette Papaj of BakeSpace.com. BakeSpace, after all, is where I spend the majority of my time online (and I did get the honey butter suggestion from my friend Shane on BakeSpace). 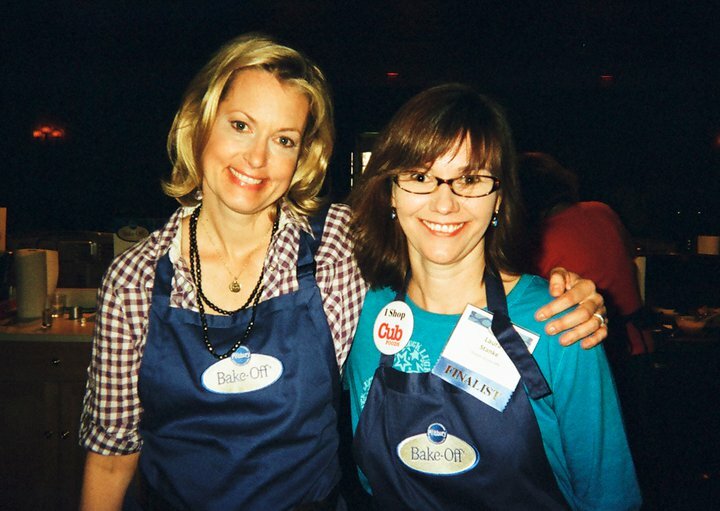 Babette had been invited to come to the Bake-Off® by General Mills and was there as one of the media. 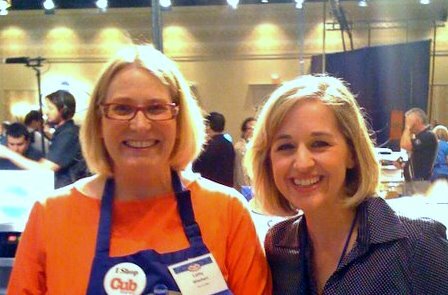 Of course, she made sure to keep her distance from me during the actual competition (we don't want anyone to think there was funny business going on), but once the recipe was turned in, we had a chance to catch up. 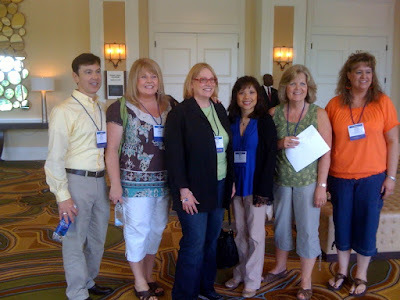 The competition had ended and now it was up to the judges, sequestered in a room somewhere behind us. General Mills takes great care to make sure the judges (there were 12--3 per category) don't have any contact at all with the finalists. They even stay in a different hotel. I could only imagination the hard decisions (not to mention the indigestion) that was going on in that room. As for us, we had a few hours of relaxation before the cocktails and the awards ceremony was to begin. We tried for a group photo, but everything was so rushed that not everyone made it. 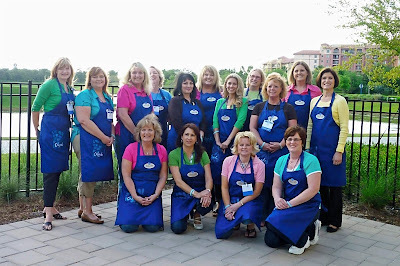 Several days before the event, all of the finalists received an email announcing an exciting new twist. This year, for the first time ever, the million dollar winner was going to be announced on the Oprah Winfrey show. The way it would work is that the four category winners would be announced at the awards ceremony, as scheduled. Immediately after the announcement, those four winners would be whisked to Chicago by private plane (Pillsbury's not Oprah's) and they would appear on the show live on Wednesday. As a result of this latest twist, we all had to have our bags packed and ready to go before the awards ceremony. One guest each would be flown out the following day to join the category winners in Chicago. Now, we can only surmise what happened to cause this change of events so close to the actual day. I'm sure there was some kind of legal disagreement between General Mills and Food Network, but we were not privy to any of that information. Some people were a little upset by this...what kind of closure would 96 of us have after the awards ceremony? We wouldn't find out who the winner was for 2 days! But, I really didn't mind too much. Think about it---there was a chance of being whisked away and appearing on Oprah! My stomach was in turmoil as I packed my bags. 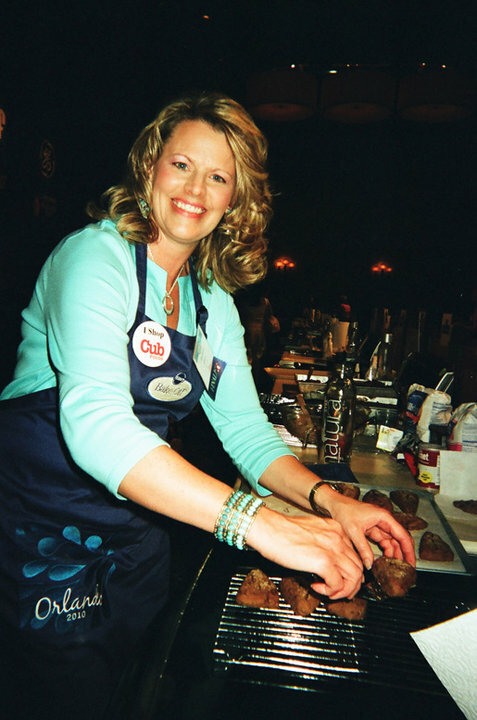 By now, we all know that Sue Compton was the winner. I have to say, she was the nicest woman you could ever meet and I am so happy for her. In fact, I took a little survey at work: Do you want me to bring my waffles or should I make the million dollar recipe for you? 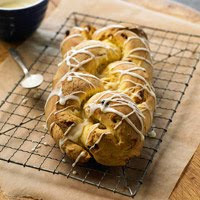 It came as no surprise to me that, once again, Sue's recipe won out. I brought her Mini Ice Cream Cookie Cups to work on Thursday and they were a hit. 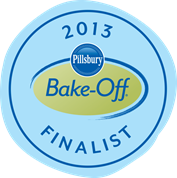 I see why they won: Classic tastes (raspberry and chocolate), easy to make and appealing to the whole family. Plus the recipe uses a boatload of sponsor products. As for me, and the rest of the finalists, we were all winners. It was an experience of a lifetime and we've made friendships that will last forever. 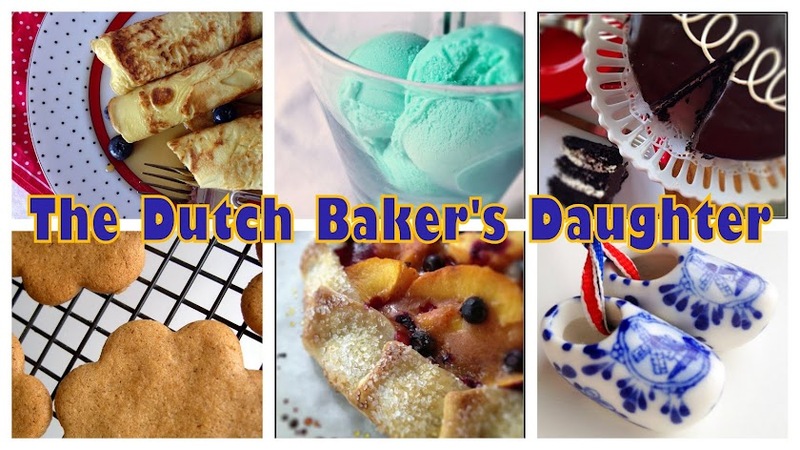 I don't think I'm the only one that is already thinking up recipes for the next contest. See you in two years, Doughboy! Jannine has a final dance with Poppin' Fresh®. 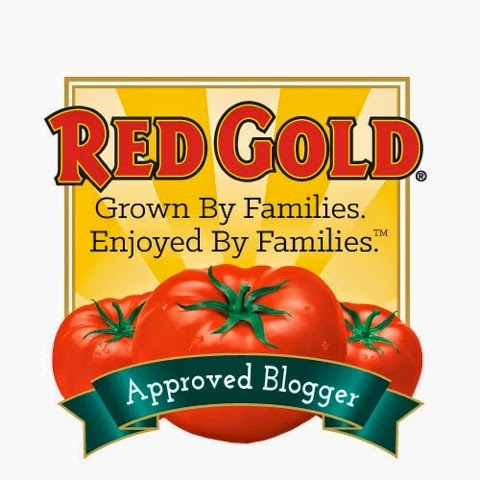 A special thank you to Laura Stanke, Karen Stuber, Joan Cossette and Babette Papaj for the use of their pictures.....and a link to a video made by NYCityMama, one of the bloggers at the event. She captures the excitement of the Pillsbury Bake-Off® through the eyes of the media. As soon as the temperature hits above 40 degrees in this part of the country, we break out the grill in our family. This year we were lucky as the weather has been cooperating most agreeably. The grill got its first workout two weeks ago, a dry run if you will, with just some hamburgers, brats and hot dogs. The highlight of that meal, however, was the one side dish I make for every grilling occasion: my mother-in-law's Mashed Potato Salad. Sounds weird, right? Mashed potato salad? Well, there is nothing weird about it....these are potatoes mashed with slaw dressing and mixed with colorful, crunchy veggies. Even my daughter's picky boyfriend loves this...sans onion, of course. Mash while still warm and stir in coleslaw dressing and mayonnaise. I like Marzetti Slaw Dressing. This could be because I've never tried any other kind....I saw that this comes in a light version, too. I usually eyeball how much of the slaw dressing I put in, too. This time I used about 3/4 of the jar. It may seem like a lot, but it is being absorbed by the warm potatoes. Add a nice little gloop of mayonnaise at this point. I'm not sure why this step is in the recipe. It may cut down on the sweetness of the slaw dressing, or it may help with the creaminess. I go ahead and use light mayo and no one is the wiser. Add eggs, onions, celery, peppers and carrots. Season with salt and pepper. The chopping of the veggies is what takes the longest time.....such an easy recipe. Place in large serving bowl. Garnish with additional egg slices and green pepper. Sprinkle with paprika. Chill or serve at room temperature. I guarantee that you'll want to make extra. Who knew potato salad could be so tasty?